Rheinfels Castle was once the largest and most impressive castle on the river Rhine. Today unfortunately it’s remains are only the ruins of it’s past glory. The castle is located in the town of St. Goar in Germany among the mountains which rise on both banks of river offering magnificent views of the river Rhine. Today most of the castle Rheinfels has sank in ruins, but some of the nearby buildings located outside are restaurants and luxury hotels. In some of the better preserved parts of the palace museums were built where you can buy various souvenirs and postcards, reminiscent of the former splendor of Rheinfels. The foundations of the castle Rheinfels were built in 1245 by Count von Diether V Katzenelnbogen. The end of the glorious times Rheinfels occurred during the French Revolution, when the army almost completely collapsed it in 1797. However Rheinfels is considered the largest castle near the Rhine. The remains of this show that in the past the castle covered five times more area than what is covered in the present day by the ruins. When Diether IV. 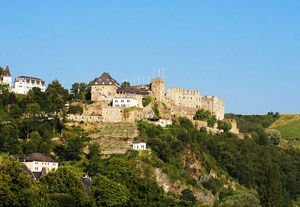 Von Katzenelnbogen decided to build Rheinfels in 1245 his main idea was to defend the fortress town of publicans Sankt Goar. Over time the original building not so impressive passes in various transformations and emerged as the most impressive castle along the Rhine. Then the real castle Rheinfels had been virtually impregnable. For centuries castle Rheinfels was the last possession of the counts of Katzenelnbogen. Thanks to its skillful marriage policy and some key pieces of their extended family it had emerged as one of the most influential and important in this part of the German Empire. After the construction of the castle Katz, who is on the opposite bank of the Rhine, the importance of castle Rheinfels became even more because both castles united in general forces over the blockade river. At the end of the 15th century at the height of their territorial and political power one of the Counts Katzenelnbogen died. In the siege of the castle of the French revolutionary army, it was betrayed into the hands of the french without any resistance. In 1796 - 1797 the enemy army blows up the outside walls of the castle Rheinfels. Today castle Rheinfels tours are conducted by a larger group and it is needed to make a reservation. There is an option to hire a tour guide with which you can walk around the ancient fortress of Rheinfels with.